Find out more about IR Magazine’s series of Women in IR events and book your place for the next event, which will take place on Thursday, September 13 in New York. 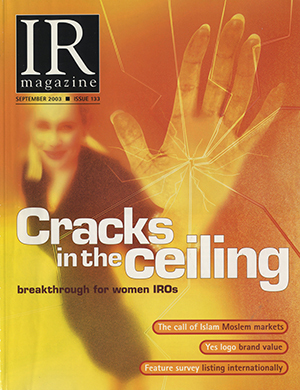 Thomas also looked at IR from the perspective of a stepping stone to higher-level finance roles and examined some of the possible reasons so few women cracked the ceiling above IRO level. Monika Steinlechner, then head of investor relations at South African telecoms company MTN and who left the firm in March this year, suggested avoiding being penned into a certain area of business by insisting on broader responsibilities. The years since have seen IR become a more strategic role in general and, of course, a number of those men in the top jobs have moved on. Organizations like the 30% Club as well as governments have pushed for greater gender diversity at the top levels of business. But while women have consistently made up around half of all IR roles, research by IR Magazine has shown in the past that women are also paid less than their male counterparts and are far less likely to hold the most senior IR roles. Of course, that doesn’t mean there aren’t a number of incredibly successful women in IR – Craig being one of them. In an opinion piece for IR Magazine last year, she continued her conversation from 15 years ago, writing about the slow changes continuing to take place in the profession and in finance roles in general. Craig adds that in many companies, corporate functions like finance, legal, human resources, communications and so on have in some cases a higher percentage of women than men, but women still do not gain the top job.